The Company anticipates releasing an updated mineral resource estimate and mine plan in Q1 2019. With increased understanding of both the geologic controls and mineability of the Yaraguá and Veta Sur deposits, the Company expects that the updated mineral resource estimate and mine plan have the potential for larger, more productive stopes in the broader mineralized zones. As a result, the Company anticipates that the updated mine plan will improve mining productivity and reduce associated project start-up risks. TORONTO , Oct. 16, 2018 /CNW/ - Continental Gold Inc. (TSX:CNL; OTCQX:CGOOF) ("Continental" or the "Company") is pleased to announce additional high-grade assay results from underground channel sampling results and six holes drilled into the Yaraguá system as part of its 2018 exploration drilling and underground channel sampling program at its 100%-owned Buriticá project in Antioquia, Colombia . The Company presently has 14 diamond drill rigs in operation; three rigs are being utilized for the recently-started stope definition drilling program, eight rigs are conducting infill and mineral resource expansion drilling at the Yaraguá and Veta Sur deposits and three rigs are testing the Laurel and Perseus greenfield targets. "The Buriticá project continues to demonstrate its prowess as a rare world-class system, both in terms of its size and high grades. The system is so vast that it will take years of drilling to determine just how many ounces of gold will ultimately be mined from the Yaraguá and Veta Sur deposits," stated Ari Sussman , CEO. "With the new results announced herein, the Yaraguá system now measures 1,350 metres laterally by 1,800 metres vertically and remains open in all directions for expansion. We look forward to incorporating all new results into an updated mineral resource estimate and mine plan in Q1 2019." A fan of six diamond drill holes were completed from an underground chamber installed off of the main Yaraguá ramp currently advancing ahead of planned commercial production for the Buriticá project in 2020. Drilled to the northeast, the fan of holes had the dual purpose of infilling an eastern section of the Yaraguá deposit as well as testing for extensions to the system along the San Antonio master vein family. Drilling covered 150 metres of lateral strike by 475 metres vertically and mineralized zones reported below remain open both up and down-dip for extensions. Four distinct zones of mineralization were outlined from the drilling. The first two mineralized zones, located at shallow distances from the drill hole collars, successfully infilled seven veins within the Murcielagos vein family at the eastern edge of the mineral resource estimate block model. Impressively, the precious metal content is more than 125% higher on a weighted average grades X true widths basis than the mineral resource estimate block model. As a result, the Company is accelerating drilling plans on this section with an aim of sequencing mining into the early years of production. Given the high-grade nature and easy access from ongoing mine development, plans are being made to access this area of eastern Yaraguá for definition drilling anticipated to begin in Q1 2019. 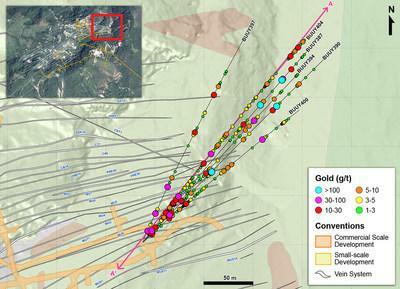 4.12 metres @ 18.66 g/t gold and 35.84 g/t silver along 20 metres (east drift on San Antonio vein). Stope definition drilling for BMZ1, at 10x10-metre spacing, is now underway with first results anticipated in November 2018 . Underground development along the veins was sampled by trained crews under the direct supervision of mine geologists. The sampling consisted of channel samples that were taken by hammer and chisel across the full width of the face every 3 metres along strike, or along the rib of the drift continuously at selected locations. Distinct geological zones were sampled separately (vein separate from wall rock), with minimum-maximum horizontal sample widths of 0.2 to 1.0 metres. The widths of the channels were adjusted so that each sample weighed between approximately 2 to 8 kilograms. Sample locations were measured from a surveyed control point. Duplicate channel samples were collected with a frequency of one every 25 samples. Bar code tags were inserted into the individual sample bags by the geologist, including duplicates which were numbered in sequence with the primary samples. The bags were then secured with a cable tie and transported out of the mine by the sampling crew to a secure staging area on surface using a procedure supervised by the Mine Geologist and Chief Geologist. Channel samples were prepared and analyzed at Continental's Yaraguá mine laboratory at Buriticá, Colombia . Blanks, field duplicates from each heading, pulp duplicates, check assays and analysis of results using industry-accepted best practices and certified reference standards are inserted into the sample stream to monitor laboratory performance. Channel samples were analyzed using a 50-gram gold fire assay with gravimetric finish. All silver values were determined by four acids digestion and atomic absorption method.